CBS had a very CBS audience for its tribute to itself. 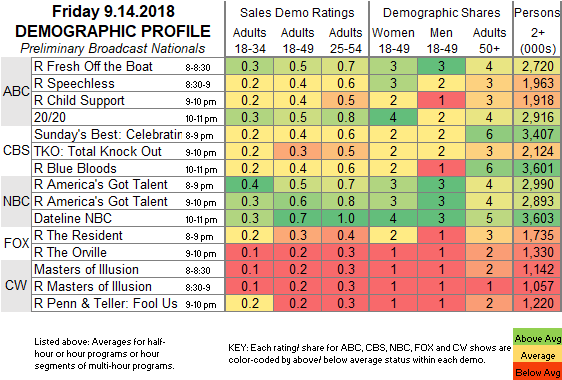 CBS: The SUNDAY’S BEST special was at only 0.4 in 18-49s, but tied with the night’s rerun of BLUE BLOODS (also at 0.4) for the highest rating in the 50+ demo. TKO: TOTAL KNOCK-OUT dropped 0.1 to 0.3. ABC: After reruns at 0.4-0.5, 20/20 was down 0.1 to 0.5. NBC: DATELINE was steady at 0.7. It was preceded by an AMERICA’S GOT TALENT rerun at 0.6. CW: The new MASTERS OF ILLUSION held at 0.2, the same as the rerun and the PENN & TELLER: FOOL US rerun that followed.